An eight channel DMX to normally open (NO) or closed (NC) relays PCB only. The relay switch level can be user set in 10% steps. 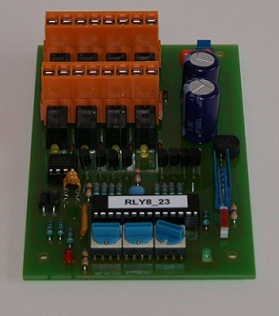 The card can be user set for normally open or closed relays. The relays will switch at the set level and switch back at 1% less to allow for noisy desks. Displays for power and data in.